An action packed fantasy novel written for young adults and the young at heart, this new reign fantasy trilogy by Emma Right captures audiences with an epic tale of a kingdom without a king, a keeper with secrets, an ancient curse and a teenage Elfie (a blend of an elf and fairy) boy who has the power to find the truth and reverse the curse. 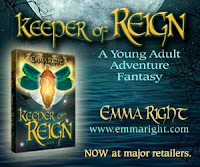 Keeper of Reign by Emma Right, a finalist for the 2013 Readers' Choice Award is available at Amazon, in Kindle Edition and other fine on-line bookstores. Be sure to visit Emma Right for more information about Keeper of Reign. You may also follow Emma on twitter and catch her latest tweets. Congratulations Emma on being chosen as a finalist for the 2013 Readers' Choice Award. Christian authors sharing Christian books through the power of Christian Book Marketing.